An important part of the startup investment process is finding quality crowdfunding platforms. SeedInvest is one of our favorites. Why? Because a successful startup requires more than just a good idea. It needs a team of savvy founders and advisors to turn an idea into an actual product and company. It’s difficult. Even experienced executives struggle to launch startups. As this chart shows, a basic vetting process eliminates most startups from investment consideration. Since its inception in 2013, SeedInvest has conducted raises for more than 150 companies, raising more than $100 million. In that time, SeedInvest has had more than 25,000 startups apply to raise capital on its platform. Only about 1% have made the grade. 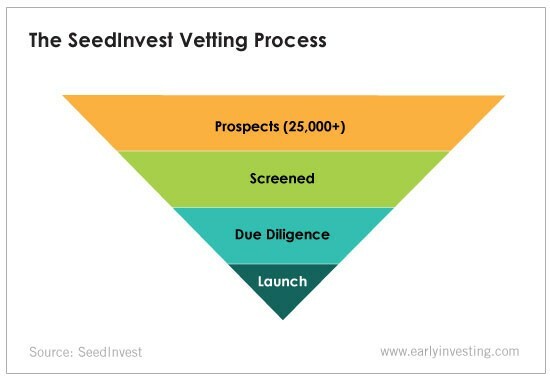 SeedInvest’s approach to vetting companies isn’t radically different from how most experts evaluate new companies. What is the corporate structure and ownership of the company? What is the company’s financial situation (business origins and operations, legality, etc.)? What are the terms of the company’s offering? Of course, the Early Investing team takes dozens of other factors into account to identify the cream of the crop. But the due diligence SeedInvest and other portals do is critical. They provide a kind of guiding light. Rather than taking a shot in the dark, you’re reaching into a basket of startups with the best potential for success. Of course, as an investor, you must do your own due diligence when vetting investments. But humans are emotional beings. It can be easy, especially in startup land, for investors to fall in love with a particular company and fail to account for all its risks. If you stop paying attention to the metrics – projected expenditures, raise amounts, use of funds, etc. – you can end up on a sinking ship. Portals like SeedInvest can help make the journey a little bit easier.